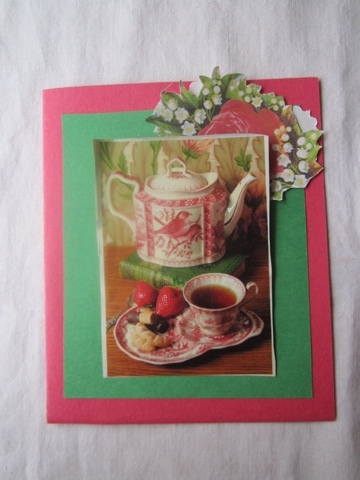 Today I am showing my own vintage hand made cards from a past post. The cameras today are obviously better than the one I was using so many years ago when I made these cards. The above card was made with things from the dollar store. I may still have these cards in a folder somewhere around here. 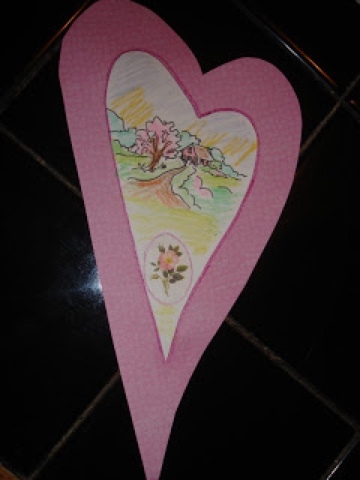 Below, I used old fashioned construction paper which was interesting to work with and seemed to take glue and glitter without getting soggy or buckling. The pictures were clipped from catalogs. 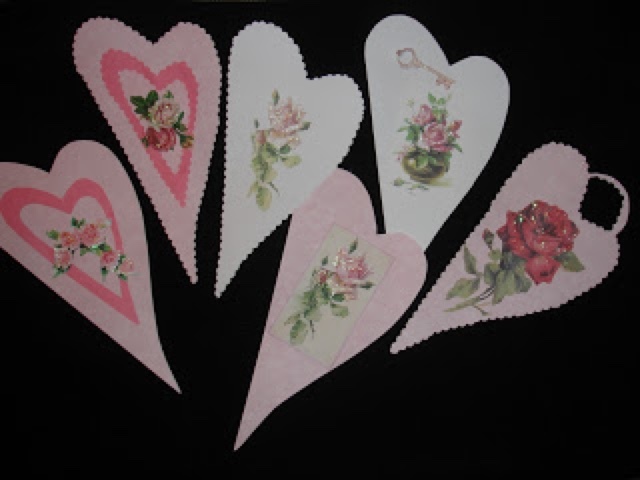 That year, I ordered some clip art graphics of Catherine Klein clip art and some antique roses graphics, but I am not sure which company it was. 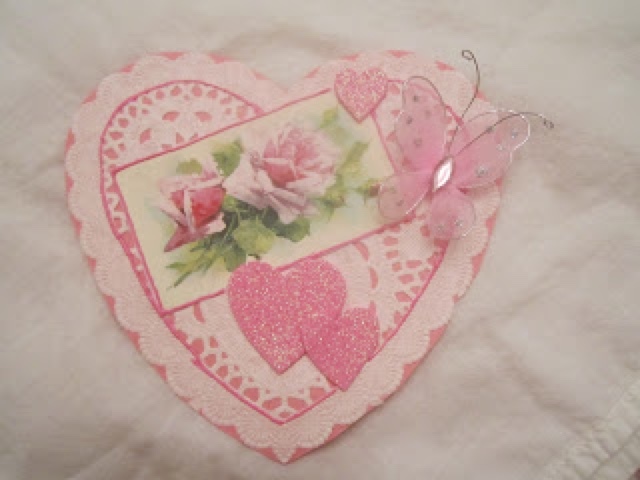 Due to things that come up which need attention, I am usually late for every event, but I still might have time to make a card, set a table, and create a new post. Mr. S. had an interesting mishap Saturday night while he was polishing up his sermon and finishing the church bulletin. The trend now is to put the bulletins online, but Mr. S. still likes to print the bulletin and put those nice fresh copies hot-off-the-press on a little stand at the entrance where people eagerly pick it up before they sit down. One man calls it his "weekly reader". I hope he didn't mean "weakly" reader. When he was a boy, Mr. S. got his front tooth chipped and that's another story. But Saturday night out of nowhere for no apparent cause, the cap on his tooth fell off. He calmly put it on his pocket and came to tell me what happened. I told Mr. S. To call one of our sons for a substitute preacher but he thought it was too late to arrange it. I even asked if he might skip the lesson and continue with the rest of the worship service but he was not ready to wave the white flag. It was 10:00 Saturday night and Mr. S. contacted his dentist emergency number to find out what could be done. The receptionist told him the dentist in our nearby small town did not do any work late at night unless it was an emergency. Mr. S. said it was definitely am emergency because he had to preach in the morning and he wanted to be able to pronounce his words without a lisp. The dentist drove into town from his country home and met Mr. S. at the door of his office. He unlocked and they both went inside, where Mr. Dentist turned on the lights and fixed Mr. S.'s chipped tooth. Mr. S. thanked him, adding, "I'm not sure my wife will be as thrilled. She was hoping for a shorter sermon tomorrow." When I heard the door unlock at 10:30 pm I thought surely he didn't get the tooth fixed that fast! He had only been gone since 10:00. Maybe the dentist was in a hurry to get back and used a super glue for teeth. I don't know, but it seemed like a very fast trip. That reminds me of Mr. S.'s mother. Every so often on a Saturday evening she would say to his father, to whom she had been married 60-plus years "Joe, I wish you would write a new sermon. I don't want to hear another re-run tomorrow." 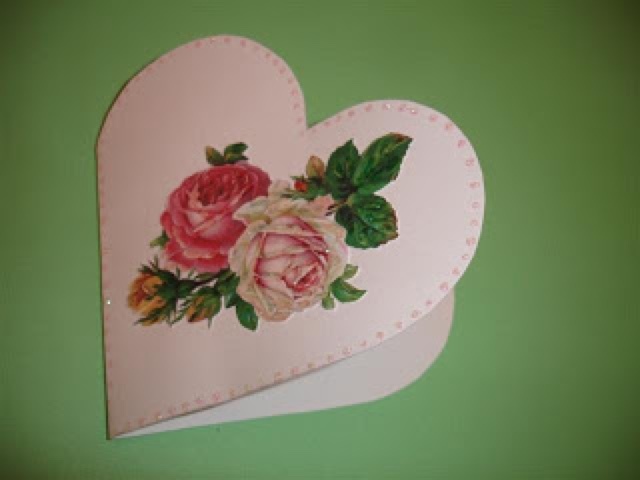 Your handmade cards are very sweet and romantic. My husband did SuperGlue his tooth back in! Years ago we were at an outing for our daughter's Karate school. They served cook-out food and while we were in the line to get our food, my husband's fake front tooth fell out! So what did he do? He ran to the drugstore and got a tube of SuperGlue and glued his tooth back on. His troubles that day weren't over. We finally got our food and went to sit in folding lawn chairs. His collapsed as he sat down and he hit the ground and his food went flying. Poor guy. He was so mad but my daughter and myself couldn't help but collapse in laughter. Shortly after he, too, thought it was hilarious. Your cards are beautiful. I love the roses and soft colors. Happy Valentine's Day to you! It is of interest to me that older construction paper is more sturdy...older is better in this case it seems.